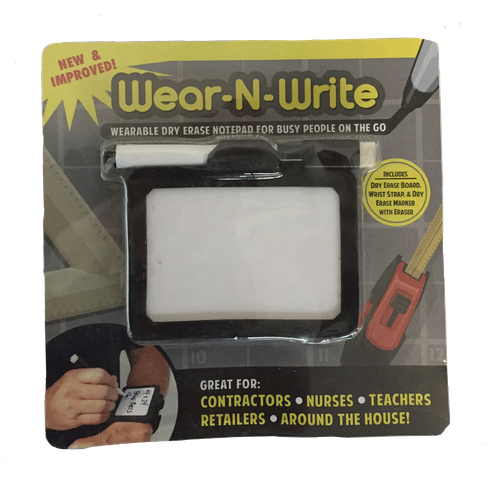 Wear-N-Write Dry Erase Board You Wear on Your Wrist. Large 3.25" x 2.25" dry erase board writing area for capturing multiple notes throughout the day. Whiteboard erase marker with built in eraser included for long lasting use. Makes a great addition to any tool set. Light weight low-profile design makes for ease of movement. Built in pen holder so your marker is always available. Elastic wrist band for all day comfort on any size wrist. Great for contractors, teachers, nurses, pilots, and homeowners. Add a Wear-N-Write dry erase one to your tool set now.